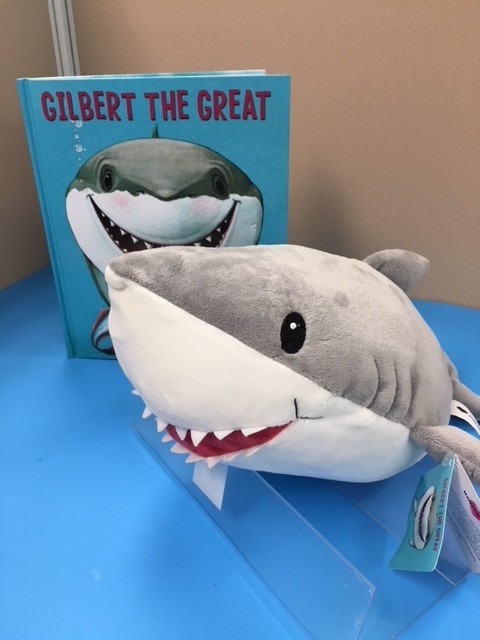 This month’s giveaway includes an adorable plush great white shark named Gilbert and his very own picture book titled “Gilbert the Great.” The book explores a close friendship that suddenly changes when one friend moves far away with his family. This month’s prize also includes a new pack of colorful fine-tip markers, which are guaranteed to make paper grading more fun in the fall! To enter for a chance to win this “shark-tacular” prize, leave your answer to the question below in the comment section. Be sure to do this before midnight, June 10. What is your favorite ocean animal? Check out these six shark facts! PS: Get your students outdoors for some fresh-air fun. Click here for super-cute activities. My favorite ocean animals are dolphins. As a child, my brother was obsessed with sharks. He carried around a kleenex box full of sharks that he drew and I would be forced to pull a shark out of the box and listen to my brother ramble facts about that shark. Now, many decades later, I have a vast knowledge of sharks from him and him forcing me to watch PBS specials about sharks. My students love when I share all this knowledge with them! My class has really taken a shine to sea turtles. I love teaching about any ocean creature but sea turtles are fascinating. I like to introduce them right after Earth Day because there are lots of conservation issues that can be covered regarding the health and safety of sea turtles. This is always a class favorite! The Dolphins. I remember watching a TV series back a few years ago with a Dolphin called “Flipper”. I got to see see them up close on a Caribbean Cruise with my daughter and the Girl Scouts. Also saw them at the Dolphin Show at Brookfield,Zoo in Chicago, Illinois. My favorite fish is dolphins. Every summer when we go to Wildwood Crest, NJ we see dolphins swimming up and down the coast. Dolphins, ever since I got to see LOTS swimming alongside our cruise ship last summer! Dolphins love listening to them talk. All ocean life is facinating to me! I live in the middle of the US, so I rarely get to see these creatures. I really like the personality of dolphins. The Grey whales as they migrate south past our Oregon coastline. They are majestical..
Baby sharks..(doo doo doo doo doo) ???????? See what I did there? Ha! ???????? My friends and I like to randomly sing this to cause an earworm. It’s been months now! Life with the Littles makes you a little mad I think. But on a good way. Dolphins always seem to be having so much fun…so I guess dolphins. I like the sea turtles best. Too many to choose from….today my favorite is whales. Our favorite (my son and I) love dolphins! I teach kinder at the school he just graduated Kindergarten at and our school mascot is “Finley the dolphin!” Our motto for our school is “We can’t hide our dolphin pride!” He would love to win the shark and story as he has also become a strong reader while in kinder and we are so proud! They are great for nursery school math activities and there are tons of cute crafts you can do revolving around them! My favorite ocean animal are whales! ???????????????????????????????? Sea turtles are my favorite! I like manatees the best. Beluga whales. Those sweet marshmallow heads get me every time! I love manatees and sea turtles! Octopuses are pretty cool too! My favorite ocean animal is a humpback whale. Love, love to see them breech! Sea turtles are definitely my favorite. They seem so gentle and are amazing creatures. The ocean is full of so many wonderful creatures. I sure love the white shark and sea stars and my little guys LOVES all sharks! He made up a shark, ‘The Rainbow Pickle Ahark’ who Lives in the waters off of Africa. There are so many fabulous sea creatures but I have always loved star fish or sea star. I fortunate enough to grow up by the water and have loved them since I was a child. Without a doubt, sea horses! For our 25th Anniversary, 6 years ago I was able to swim with the dolphins ??? ?, that is my favorite ocean animal! Under the sea is our topic at the minute and the children have engaged so much! I would have to say the octopus is my favourite ocean animal, as we have learned so many interesting facts about them. My favorite ocean animal would have to be dolphins. They are adorable. Seahorses for me! What wouythe mermaids ride without them? My favorite ocean animal is the star fish. I love echinoderms! The kid in me still thinks that it is amazingly cool that they shoot out their stomachs to eat. How impressive would that be on a dinner date?! Do I have to name just one? Dolphins, Sea Turtles, Belugas and Manatees, I love them all. I guess dolphins the most but not by much. My favorite ocean animal is a seahorse. Loved reading Mister Seahorse by Eric Carle. Dolphins are definitely my favorite! Sharks are my favorite ocean animal!! My favorite ocean animal is the octopus! ???? The octopus is one of my favorites. Sea dragons are really different and fun to see. I love sharing fiction and nonfiction stories about animals with my kindergarten class. They seem to like dolphins and sharks. Whale sharks are my favorite ocean animals. I love connecting stories with a stuffed animal from the book! It brings the story to life! I love whales! So majestic! It is so hard to have just one favorite ocean animal- seahorses, whales, and turtles, but if I have to ……..whales as they are so interesting, having once been a land animal and twice a water animal. My favorite ocean animal is a dolphin. I love sea turtles!!! They are beautiful and peaceful creatures. Sharks. They make the best movies! I love all sea creatures! Our family went on vacation to the beach a few years ago & a school of manta rays swam by my daughter & me. It was amazing! I believe the manta rays are my favorite! I don’t know that I could pick a favorite. I love seals and sea turtles, dolphins are very cool too. I love sea otters too! I really like dolphins because they are very intelligent. I do happen to have a fondness for sharks as well because they are the mascot at my school that I teach at so that is why I would love to have this book to enjoy with my students! Jellyfish but only to look at. Whales have always intrigued me. Dolphins are fun to watch surface but squid and their “cousins” cuttlefish are fascinating to me! My favorite ocean animal is a dolphin, because dolphins are very intelligent, empathetic animals. They can communicate with and understand each other. And, they can also communicate with people. They seem very curious as well. Here is a video telling how intelligent dolphins are: https://www.youtube.com/watch?v=05PpTqtGhGU . Great blue whale cause it’s the biggest! Dolphins have always been my favorite… but sea turtles too. When my husband and I were on our honeymoon in Hawaii we were snorkeling and these giant sea turtles (2 or 3 of them) swam right by us. It was amazing. My favorite ocean animals are Octopuses ????! I love all but sea turtles are probably my favorite! My favorite is the leafy sea dragon. I like lobsters! Super cool creatures! I love the lion fish. So unique!!! Roo many fave sea animals but I’ll say the seahorse. So many to choose from! I’ll choose dolphins! I have a few ocean favorites. Lol. I love manatees, sea turtles, and sea horses. Not sure if I could pick just one. I also love the orca whale. They are gorgeous creatures. ???? My favorite is whales ????! I love sea turtles! This would be fun to win as I’m moving from 4th to 1st next year! My favorite ocean animal is either a manatee or a dolphin. Sharks!!! My classroom has many and. Am always wearing something with a shark on it. I’m also a HUGE San JoseShaeks fan!!! Go Sharks!!! My favorite is a Narwhale! Dolphins are on the top of my list. Dolphins! (My one and only tattoo) Killer whales. Penguins. I think the octopus is my favorite, with the sea turtle a very close runner-up! My daughter and I are a big fan of sea stars! My 16 yr old daughter has rubbed off on me- narwhals!!! I would have to say my favorite sea animal would be a lobster. They are pretty interesting sea creature! Sea otters are my favorite ocean animal! My favorite ocean animal is a sea turtle. The leafy sea dragon and killer whales. My favorite ani would be a chimpanzee. Dolphins are my favorite sea animal. My favorite animal is a shark ocean or in the world! Great white ???????????? I love all of the different types of fish! Their colors and differences intrigue me. My son is two and loves sharks and jelly fish! He would love this book and stuffed shark. ???????????? Sea horses! They are unique and beautiful just like my children! Whales. No…seahorses. Wait, no…sharks. I can’t decide! Manatees…they are so ugly that they are cute! My favorite ocean animal is the shark! My whole family loves them! My daughter even wants her 3rd birthday party to be sharks! This little guy would be perfect for it! My favorite ocean animal is the manatee. They are so interesting to learn about! LOVE Sharks!! I’ve been obsessed with the movie JAWS Since I was old Enough to see it! Even did a Jaws themed “ monster “ preschool graduation a few years back to honor the movies 40th anniversary!! Gilbert looks awesome! I love hammerhead sharks best, but great whites are classic. My daughter loves sharks and I would pick dolphins. My favorite sea animals are Manta Rays. I love their smiley faces. Sea turtles are my favorite, they work so hard both in and out of the water! So many cool creatures, but I’ll say the manatee! My favorite ocean animal is the manatee. I have to go with the Sunfish. Gental giants who are just amazing to look at. My favorite ocean animal is the sea turtle!! I am fortunate to have been able to swim with/near them on several occasions. That a hard question! I’ll go with dolphins? My favorite ocean animal is the Parrotfish! Dolphins are my favorite ocean animal! I would have to go with sea turtles…beautiful creatures on sand and in the water! Basking sharks are very interesting. I found out about them when I was modeling an ocean animal report for my 3rd graders. I still have the PowerPoint that accompanied it and show it to my new classes each year. Their gill rakers are what stands out in my mind. My favorite is the Manatee! I love Dolphins! they are so cute! If reincarnation is real, I would love to change me back as a dolphin. They seem so playful and helpful and smart! My favorite ocean animams has always been sharks. I watch a lot of shark week shows and enjoy shark movies. Ooooo… hard to choose but dolphins!!! The Green Sea Turtle! I have always loved them! My favorite sea animal Is the star fish ! My favorite ocean animal is the PUFFER FISH!!!!!! Seahorses are my favorite ???? Sea Turtles! I think they are amazing and graceful creatures. I have always loved dolphins. Octopus is my very favorite! Dolphins! So graceful and cheerful. They are also intelligent. Whale shark. They are beautiful. If my son had a say, he would say goblin shark or humpback whale. He is having a humpback whale birthday party in December! Dolphins are my absolute favorite ocean animal. Starfish….Sea Turtles and Jelly fish! My favorite ocen animal (to learn about) is rhe shark. Did you know that a shark’s poop is spiral? Ever since Flipper, it has been dolphins! I love octopus, sharks, and stingrays! So hard to chose. I think dolphins are my personal favorite. However we are having the best time with the Baby Shark song. It’s kind of turned into a game among my adult friends to randomly sing it to cause an ear worm. I like to do the dance remix. My sons favorite is the sea otter. I don’t know where he got this love from but if there is a otter exhibit anywhere near us we have to go see the otters. We actually went to the mountains of N.C. because there is an otter exhibit at the western nature museum. My favorite is the dolphin! My favorite ocean animal would be a sea turtle. I love manatees. They are such gentle, beautiful animals. My favorite ocean animals are manatees. I would have to say my favorite ocean animal is sharks. They capture my student’s interest more than any other animal. There are several cool sea creatures, but I have a fascination with sharks! I can’t wait for Shark Week! My favorite ocean animals are dolphins!! I have yet to see one on our beach trips! We have seen sharks though close to the pier!! My favorite ocean animal is the shark. I don’t want to meet one face-to-face, but I find them fascinating. I love teaching about the oceans! My favorite ocean animal is the shark. My students adore learning facts about this animal. My favorite ocean animal is a dolphin! Seahorses are my favorite ocean animal! So many tough choices! I love dolphins and penguins, but my favorite ocean animals are sea otters, because they remind me so much of my favorite dog breed the dachshund. My favorite ocean animal is a seal! Sea turtles are my favorite! I love them! Sea turtles are my favorite. I like a star fish and a sea horse. I enjoy doing a theme about the ocean creatures. My favorite sea animals are sea turtles. We were excited to get to see a nest just hatching from a dune on our vacation one year. It was so much fun, but oh what a struggle to get to the water!! Cutest little things ever! The otter is my favorite. I saw them at the Monterey Bay Awuarium and fell in love! Sea Turtles are my favorite ocean animal. My favorite sea animal is the sea turtle! Sea Turtles! Two years ago I got to see baby sea turtles hatch and make their way to the water, it was the most amazing thing! Sea turtles are my favorite!! I love sea turtles the most. I love sharks! The things that scare me the most are fascinating! I love the ocean and it’s inhabitants. It’s difficult choosing just one. Hmmmmm…. I guess I will choose manatees . My favorite ocean animal has to be the dolphin! Dolphins I got to see some when I went to the beach. My favorite Ocean animal is the tiger shark. My favorite aquatic animal is whales of all kinds. My favorite ocean animals are whales of all kinds. Dolphins ???? but I have to say I was very impressed with everything that I learned about sharks when I did a unit on them with my class! I have always LOVED sea turtles! They are majestic! Dolphins are my favorite, with sea turtles being a close second! Sea Turtles are my favorite ocean animals. I was able to watch them hatch and make their way to the ocean. So amazing! My favorite ocean animal is the octopus. My favorite, if this counts, is the fictional mermaid. If real, the sea turtle. My favorite sea animals are dolphins! Sea turtles, but my son loves sharks! My favorite ocean animal is the manatee! They are so darn cute! My favorite ocean animal is the salmon. It’s strong, determined, focused, and resilient. (It does also taste good and is a healthy fish). My favorite ocean animal is a whale. I love sharks, dolphins, sea turtles, and sea horses. My favorite would be the seahorse. Beluga whales, they alway look happy ????. Sharks! Always the favorite for my students during our ocean unit! Sea horses are so cool! !